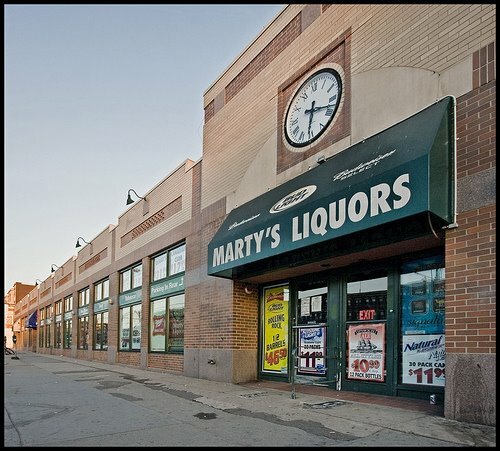 So the Allston location of Marty’s Liquors is closing this weekend. Don’t worry, I’m not going to wax nostalgic about the closing of a liquor store. I have no memorable stories about the time I bought a six-pack or a keg or anything there, or of a great wine discovery. But Marty’s does hold a sort of special place in my heart, I guess, because when I first moved to Boston 12 years ago, I thought it was cool that a store right down the street was named Marty’s. (Yeah, I’m that much of a dork.) 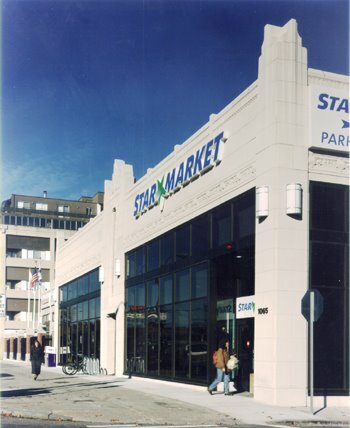 And yes, I made a few purchases there over the years, but whatever … my alcohol tastes were never of the Allston variety. Besides, I learned pretty quickly to stay as far away from the corner of Harvard Ave. and Comm. Ave. as possible. But anyway, even though I shed no tear over the closing of Marty’s Liquors, I will come to its defense in one way: The reason this store is closing is because it couldn’t come to terms over a rent increase by its landlord, the Hamilton Company. Sound familiar? That’s because Hamilton was my old nemesis when I lived at 110 Babcock. I have nothing but sympathy for Marty’s if they’re being pushed out because of those greedy bastards, who raised my rent $200 when they bought the building and then never did anything to improve the quality of life there. Hamilton is the reason I bought a condo when I did (though it must be said, the whole condo-buying thing worked out pretty well for me). This situation kind of makes me want to go buy a bottle of wine at Marty’s just for old times sake. At the very least, I’ll raise a glass in its honor. If there’s one thing I learned this weekend during the move, it’s that I, Martin Lieberman, am quite good with the spatial relations. You see, all was going pretty well Saturday morning. Other than some early-morning mist, the rain mostly held off. The elevator in my building was on the fritz, but somehow it worked until the last load had been brought down, and then it died. The movers got to me a little bit later than expected, but it gave me some extra time to take care of some last-minute packing I didn’t do the night before. So it was all good. But when we got to my new place and started to unload the truck, my couch wouldn’t fit through the apartment door. 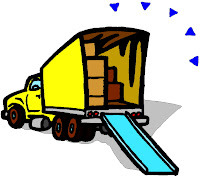 The movers tried multiple ways of fitting it through the door, but none worked because the doorway was too thin, the stairway was in the way, and the sprinkler system was inches too low from the ceiling. Awwwww … how sweet. On my last day in the apartment, as I’m packing up and throwing stuff out, feeling happy and relaxed and having fun, I’ve been blessed by my neighbor with yet another flute recital. How did she know that’s exactly what I wanted? I guess since it’s 4:45 in the afternoon I don’t have a very good reason to make her stop (other than my perpetual annoyance and her seemingly uncurable lack of courtesy and the fact that I can hear it even when I go outside — and the fact that the building managers have asked her and her roommate to stop practicing their instruments in the building not once but twice), so I guess I’ll just let her play. And I’ll even join in the fun by blasting my music really loud and seeing how she likes it. Everybody gets something! Hooray! I’m just a few short days away from officially being a homeowner, and less than two weeks from moving into my new condo, so I figure it’s high time I made a real dent in my packing. Lots and lots of purging.